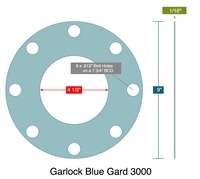 Garlock 2900 NBR Custom Full Face Gasket - 5.13" ID x 6.94" OD x 1/32"
Garlock® 2900 is ideal for utility services. It offers excellent sealability. 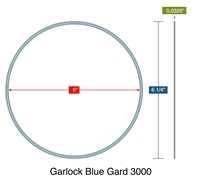 Due to its unique blend of aramid fibers, fillers, and a NBR rubber binder, it provides improved torque retention and drastically lowered emissions levels. It cuts operational costs through reduced waste, maintenance, stocked inventory, fluid loss,and energy consumption. Garlock 2900 NBR Custom Full Face Gasket - 6" ID x 8.25" OD x 1/32"